Let us know the size, shape, type, owner, and the desired location of the aquarium and we will prepare and design a quotation to fit your needs. Give us your vision and we will bring it to life. Arrange for a site visit so that we can make sure every specification will be taken care of and leave the work to our dedicated team, we’ll execute the full installation. Have a water master piece crafted together by our aquatic-artists. Make your own selection of fish and then feel the comfort and relaxation enfold you while watching your indoor ocean’s life and tranquility. 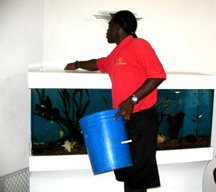 We provide weekly and monthly maintenance and checkups on your aquariums, ponds and water features. Ensuring good water quality, fish health and visual aquatic display.Visits can also be scheduled at your convenience if necessary, to ensure continuous quality service. Diagnosis of diseases and Medicating are some of the task included in our wide range of professional services. We at Ace Aquatics also specialize in providing the world’s most exotic marine tropical fish ,fresh water fish, turtles and other species of water animals to amaze you.